You're Here: Home / Blog / Digital Signage / What is the Cloud – Part 1 – Intro. Everyone appears to be talking about the ‘Cloud’ and what it is these days, with even mainstream TV adverts mentioning the term. So we thought, as we are pretty committed to the Cloud way of life, that we would over the course of a few posts go through the bits of the Cloud that are relevant to today’s Cloud based Digital Signage systems and users. 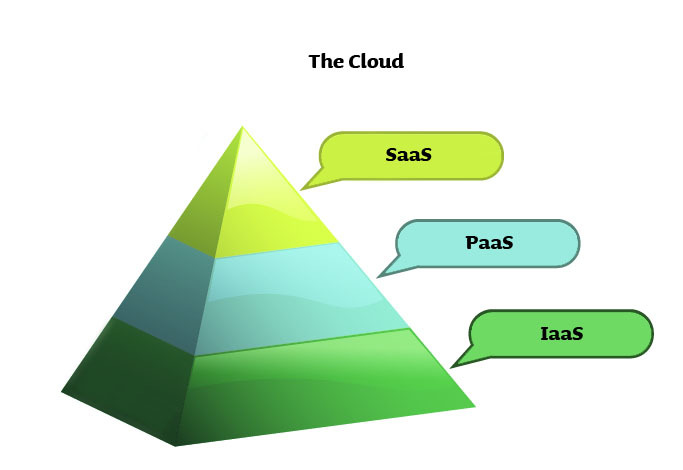 Firstly we thought it best to detail the different levels (think like an onion) of what is the Cloud (WARNING – Acronym Alert). 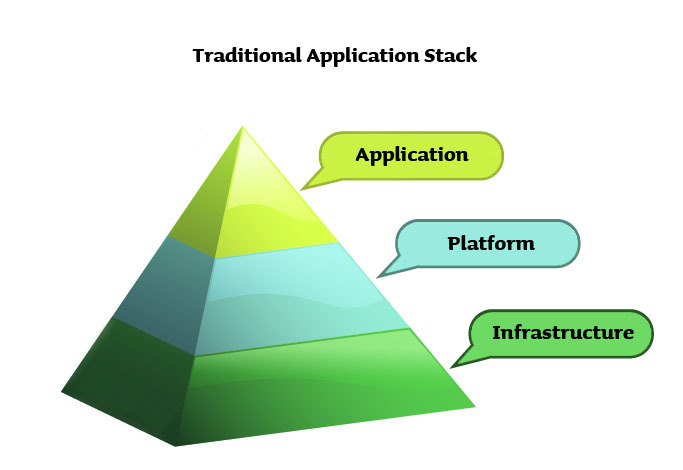 Firstly let us look at how a traditional Application stack works. An Application is of course something you use to perform a certain task, whether than is creating a spreadsheet, doing your accounts, browsing the Internet, or, heaven forbid, doing Digital Signage – this is all done using an Application. Of course an Application needs an Operating System to run on, and that is your Platform. The Platform provides a rich set of API’s that the Application can leverage to make writing Applications easier. So for example there is no need to write code that makes best use of the Graphics card if its Nvidia or ATI etc, when the Platform abstracts away the graphics card and provides a rich set of graphics functions regardless of the graphics card in use. Of course any Operating System or Platform would not be much use without some Computer to run it on. This is the Infrastructure, and the Graphics card used above as an example is part of that Infrastructure. All the above is hopefully pretty clear. So let’s now ‘Cloudify’ the above graphic with a liberal dose of Cloud Acronyms. Isn’t really much different is it? In fact the only thing that has changed is to replaced the words with Acronyms. SaaS (Software as a Service) is the equivalent to the Application layer. The primary (but as we will see in future posts on this subject it’s not quite so simple) difference is that the code runs somewhere ‘out there’ rather than running on your local desktop. Digitalsignage.NET is a great example of a SaaS application. PaaS (Platform as a Service) is the equivalent to the Operating System or Platform. The Platform provides a rich set of APIs that provide access to the operating system functionality. In addition (again we will look at more fully in a future post) PaaS provides API functionality that is more unique to the cloud such as scalability APIs. IaaS (Infrastructure as a Service), as the name suggests, provides you the computing infrastructure, physical or (quite often) virtual machines and other resources like virtual-machine disk image library, block and file-based storage, firewalls, load balancers, IP addresses, virtual local area networks etc. Amazon EC2, Windows Azure, Rackspace, Google Compute Engine are all examples of IaaS. This entry was posted in Digital Signage, Hardware, Software, Tips and advice and tagged AV technologies, cloud based digital signage, cloud computing, digital signage by hsmith. Bookmark the permalink.